Special SERP icons are displayed in the Rank Tracker Dashboard when any of the special search engine result indicators are displayed by Google in a search result for a landing page in your campaign. This information is also listed in the Excel export of a Dashboard report, and is available in the Rank Top 50 API, Rank Top 100 API, and Google SERP Features API. We currently support the following SERP result indicators, if you become aware of a new one please contact service@rankranger.com to request that it be added. Google is rich with Featured Snippets, for example, when you ask Google a question, sometimes you'll find a Knowledge Graph above the organic search results. Google's Featured Snippets extract the text directly from the web page that Google determines best answers the query, as opposed to the meta description text that displays in organic results. When featured snippet like this displays for your keyword in the SERPs, this answer box icon will display in the domain URL column of your Dashboard report. Setting the Landing Page column to "Show" will provide you with the exact page that resulted in an answer box in the SERPs. Breadcrumb trails on a page indicate the page's position the site hierarchy. If Google displays breadcrumbs in search results, you'll find the breadcrumb hierarchy icon in your rank tracking report. Schema.org provides a list of markup properties that can be used to provide search engines with the structured details needed for them to understand and display the event data in a user-friendly manner. If the site we're tracking for you uses rich snippets for events, and Google displays your event details in the search results, then you'll find the Structured Snippets icon in the URL column of your Dashboard report. If you have switched your site to HTTPS recently, you will know by viewing the Dashboard report whether or not Google is serving that version of your site. When Google serves the HTTPS version of your website, Rank Ranger displays the HTTPS lock icon in your Dashboard. HTTPS (Hypertext Transfer Protocol Secure) is an internet communication protocol that protects the integrity and confidentiality of your users' data between the user's computer and the site. Data sent using HTTPS is secured via Transport Layer Security protocol (TLS), which provides three key layers of protection including encryption, data integrity and authentication. When Google serves an image thumbnail in their organic search results for a URL and keyword tracked in your campaign, a Image icon displays in the Dashboard report for that keyword. In this example, the SERP begins with a Featured Snippet and the second organic result has an image thumbnail. If you choose to include Local results with Organic search results (refer to Local Pack Results Settings) and your primary domain ranks for one of your tracked keywords in the local pack results, then you'll see the Maps icon display in your Dashboard report. 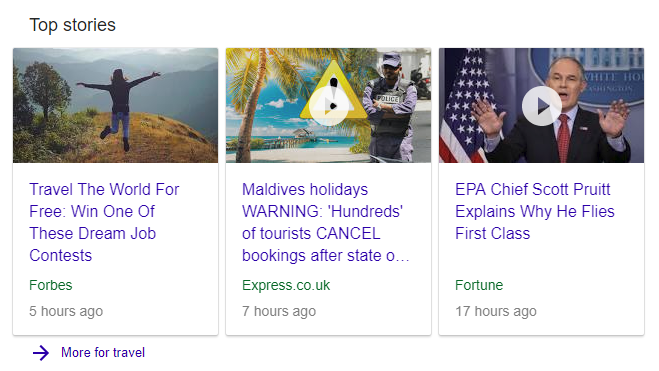 Google News results appear in a block with links to articles from various news sites. If a search for your keyword results in a link to a URL tracked in your campaign, you'll see a News icon in your Dashboard report. In an effort to improve users' search experience, Google has added what they refer to as the Notable Online SERP indicator. When Google considers a site to be widely recognized as notable online (and when data is available from Knowledge Graph sources), clicking the down arrow to the right of a search result URL provides an extra information box about the website and/or the company or organization that owns the site. If Google includes a Notable Online feature for a landing page that is tracked in your campaign, the Notable Online icon will display for the keyword and URL in your Dashboard report. Google supports the markup of ratings and reviews for businesses, products, books, movies, etc. and displays rich snippets including rating stars and summary information in the results they display. If Google displays a Rating in the rich snippet of a search engine result for a tracked keyword in your campaign, you will see a Rating icon in your Dashboard report. Helpful search boxes sometimes display in the SERPs when Google thinks the searcher is interested in searching deeper into results. If a tracked URL in your campaign ranks for a keyword that results in a search box in Google SERPs, your Dashboard report will display a Search Box icon to alert you that this helpful feature was included. 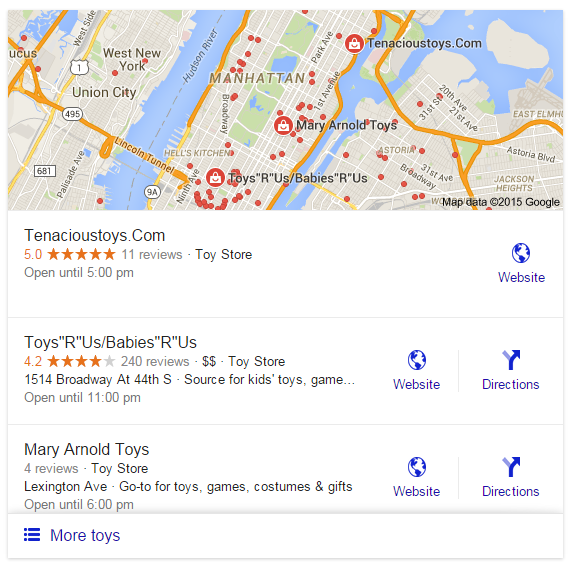 In this example, Google is serving both a Search Box and Site Links. In an effort to help users find what they're searching for more quickly, Google occasionally provides Sitelinks for directories and/or specific pages within a site's structure. In this example, Google is offering the user PayPal's dot com as well as location-based and functional links. If a keyword search results in Site Links for your campaign, the Site Links icon displays in your Rank Tracker Dashboard. When Google serves a video thumbnail in their organic search results for a URL and keyword tracked in your campaign, a Video icon displays in the Dashboard report for that keyword.